HITCHING UP A caravan is not rocket science but it’s a bit like a pilot going through their safety checks. You need to ensure that everything is in order every step of the way and once you’ve done this, the actual process is quite simple. Everything involved with the hitch involves a weight or load rating, so before you hitch up, do some homework to ensure that the vehicle and van match up. Never assume it’ll all be right. If your vehicle already has a towbar, don’t think it’ll automatically cope with towing the van you intend to hitch up. A 1200kg-rated towbar won’t do you any good towing your new 21ft tandem. A sticker or plate should be attached to the towbar assembly with the maximum weights and what vehicle the towbar is intended for. Also check the vehicle’s maximum towing capacity and towball download in the vehicle’s handbook or with its manufacturer. It would be unusual if anything’s wrong, but stranger things have happened. Now you’re armed with the load ratings of the towbar, verify the van’s Aggregate Trailer Mass or ATM on the caravan manufacturer’s plate, which is the total maximum allowable weight supported by the van’s tyres and jockey wheel, including any payload. This weight must not exceed the maximum permitted towing weight for the vehicle and its towbar. Also, the caravan’s ball weight should not exceed the vehicle’s maximum allowable ball weight. The caravan’s ball weight should also appear on the caravan manufacturer’s plate; if not, it is calculated by subtracting the Gross Trailer Mass (GTM – the maximum that can be supported by the van’s road wheels minus the jockey wheel) from the ATM. See if the vehicle manufacturer has any specific hitch instructions – for example, to use load levellers or not. Also, for a friction coupling, as used on many European vans with a light ball load, you will need a special, hardened steel towball. Ensure that the vehicle’s electric plug matches the van’s seven (or 12)-pin plug. If not, get an adapter plug for the short term, but the long-term fix is to fit a new plug, which is usually not expensive. When you hitch up a van, the additional load on the rear of the vehicle should not cause it to drop more than about 20mm on its suspension (or cause a corresponding rise at the front wheels) otherwise steering, braking and trailer sway issues may arise. Load levelling devices are normally the solution to this problem (see below). The load levellers transfer this additional weight from the rear wheels onto the front wheels. Check the static height of the vehicle before and after you hitch up the caravan. This is best done on a level surface, and with both the vehicle and van loaded as they would be for your trip. the vehicle, it is also harder to establish an accurate centre point. 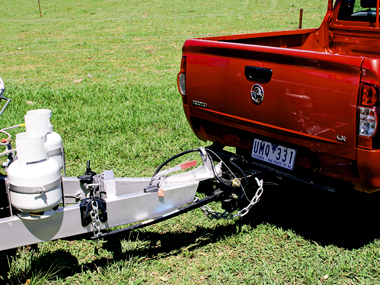 You should also check that the towball is at the same height as your hitch with the caravan sitting level. One method to match heights is to rotate the hitch receiver. The subject of many tears and frustration, reversing up to the van to couple-up is one of the more fraught towing manoeuvres. You either learn to do this with the help of an assistant or not, and there is a two-word answer if you can’t: reversing camera. A reversing camera is the easiest way to back up to a trailer but that doesn’t mean it’s perfect. The image is often reversed, so you have to counter instinct and turn the steering the opposite way when trimming the angle as you hitch up. Still, this is a do-it-yourself operation with no other guidance necessary. Even with a camera, you should still get out and survey the ground near the van before you back up, as you may find that a low tap or retaining wall is right in the way of where you intend to swing your vehicle. Also, you should still perform head checks as you reverse close to the A-frame – don’t keep your eyes glued to the screen the whole way. With a guide only, at least agree on using hand signals from a pre-arranged vantage point, and not speaking at all. With the towball directly under the coupling, it’s time to wind down the jockey wheel. It’s unlikely for anything to go awry at this point, but I always recommend that you position your feet as far away as possible from the A-frame. This is a good habit to get into, especially for later when releasing load levelling torsion bars where a slip could lead to injury. 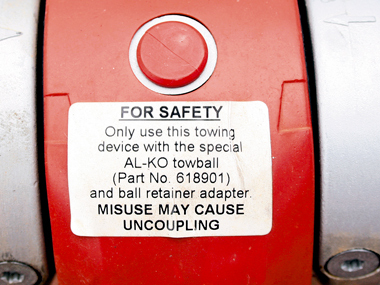 The coupling clamps onto the towball, and this clamp has to be released to allow the coupling to positively engage on the towball. The handle lifts but it’s often stiff and may require a fair bit of effort to release, and then it’s often easiest to use the spring-loaded locating clip to keep the handle up as you engage the coupling. You must remember to release the coupling so that this handle is fully seated again to be sure the coupling is locked in place. If you can’t retract the jockey fully so that the tow vehicle takes all the weight, you may have a problem with the towball height. 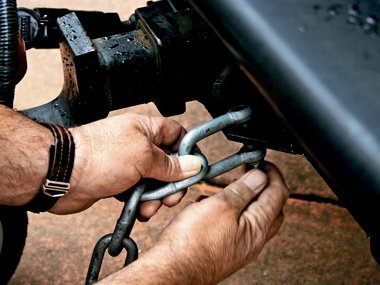 Check that the tow hitch is at a legal height from the ground – the centre of the body of the ball coupling needs to be 350mm to 460mm from the ground when laden. If the height is within spec, you will need to support the A-frame so that you can mount the jockey wheel in the position where it can be released as the vehicle takes the weight. If the jockey wheel retracts, note where on its shank it is clamped to the A-frame. There should be a ridge on the jockey wheel, and this is intended to positively locate the shank in the clamp to reduce the risk of the jockey wheel slipping. With coupling locked in and the jockey wheel raised and put away, it’s time to secure the safety chain(s) and plug in the trailer electrics. 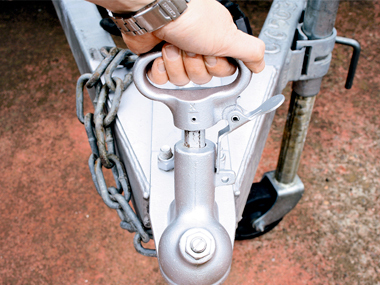 Make sure the chain length is sufficient to reach the locating point(s) provided on the body of the towbar while being able to negotiate corners, and never secure the safety chain to the removable towbar tongue. If the chain is much too long you can get links removed or simply secure a few links from the end. Don’t be tempted to nip up a shackle with pliers, as you’ll find it next to impossible to release later. With two chains, make sure to cross the chains so that if the coupling does come off, the chains will stop it from hitting the ground. Trailer plugs need to match and there are at least three different sizes of seven-pin trailer plug. At least it’s not hard to change the plug to match or buy an adaptor for short term needs. Make sure you’ve left enough slack in the trailer plug to allow for turning but not enough for it to scrape on the ground. With the van hitched up you can now re-do your wheel-arch measurements to see if the difference is more than 20mm and thus if either load levelling or load redistribution is required. 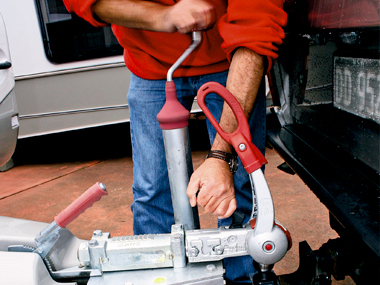 Before you invest in load levellers, ensure that your caravan and tow vehicle loads are properly distributed. Try to load the heaviest items over the axle of the caravan and ahead of the rear axle in the tow vehicle if possible. In the heavy-duty load leveller setup that many people use, you typically get a special towball tongue, two torsion bars, retaining pins, two A-frame clamps and a levering tool. The actual setting up of load levellers is not something that can be easily explained in print, as your rig may require adjustments that a set of printed instructions won’t really flag for you. It’s always best to get advice from the retailer about how to set up levellers for the first time. The angle of the hitch and the number of chain links used are crucial, and the way you tell if you’ve been successful is if the vehicle is level. It’s unlikely you’ll replicate your pre-hitching wheel-arch measurements, but if they’ve dropped by an equal amount at the rear and front, then the load levellers are doing their job. Always keep feet well clear of torsion bars when either securing them or releasing them. Foot injuries can and do happen. When securing or releasing the bars, have the jockey wheel wound out so that the vehicle is slightly raised from a level position and there is minimal tension on the bars. Lastly, you don’t want to drive off with something undone. Before heading off, always make a five-point visual check of handbrake, coupling, connection (electrical), chains and jockey wheel.